Beat the market with these five promising businesses in the coming year. The primary goal of any investor who buys stocks should be to beat the market. After all, if your stocks can't accomplish that goal, you may as well save yourself the trouble and buy a low-cost index fund to at least mirror the market's returns. But beating the market can also be a daunting task, considering you have the opportunity to buy shares in thousands of enticing businesses. So to help get you started, we asked five top Motley Fool contributors each to pick a stock they believe investors would be wise to buy in 2017. Here's why they chose Under Armour's C shares (NYSE:UA), T-Mobile US (NASDAQ:TMUS), Dave & Buster's Entertainment (NASDAQ:PLAY), Diamondback Energy (NASDAQ:FANG), and Core Laboratories (NYSE:CLB). Steve Symington (Under Armour C Shares): Class C shares of Under Armour (trading under the ticker UA) -- which carry no voting rights but trade at an attractive 12% discount to their Class A counterparts (UAA) -- touched a new 52-week low earlier this week, having fallen more than 25% since the athletic apparel and footwear specialist disappointed Wall Street with its third-quarter 2016 report in late October. More specifically, Under Armour confirmed last quarter that revenue grew 22% year over year, to $1.47 billion, marking its 26th straight period of at least 20% top-line growth. Net income per share rose a healthy 26%, to $0.29. And Under Armour followed by reiterating not only its guidance for full-year 2016 revenue of $4.925 billion (up 24% from 2015), but also its target of reaching $7.5 billion in revenue by 2018. That said, Under Armour is set to achieve that longer-term revenue growth despite a recent slowdown in the North American apparel industry -- which effectively sits at Under Armour's core -- thanks to faster-than-expected growth of both its footwear and international businesses. But because footwear and international tend to come with lower margins, and as Under Armour plans to continue investing heavily to sustain this growth and keep grabbing market share in these early stages, the company simultaneously reduced its previous goal for reaching $800 million in operating income in 2018 (up from $440 million to $445 million in 2016). Instead, Under Armour now anticipates more modest 15% operating income growth over the same period. A word of caution: Under Armour is set to release its fourth-quarter results on Tuesday, Jan. 31, 2017, which could mean more volatility depending on whether those results live up to Wall Street's expectations. But for patient, long-term investors, I think now is a great time to consider opening or adding to a position in Under Armour. 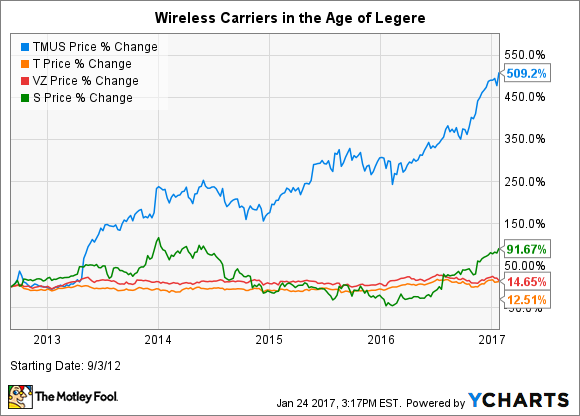 However, wireless consumers nearly missed out on Legere's Un-carrier initiatives thanks to multiple suitors attempting to acquire the company. In 2011, AT&T tried to buy T-Mobile, but the Federal Communications Commission and Department of Justice rejected the merger. Legere and company still benefited from the merger attempt; as Ars Technica noted, AT&T's $4 billion breakup fee helped T-Mobile build out its network. In 2014, the FCC again blocked another T-Mobile acquisition attempt, a $32 billion buyout offer from Sprint. However, there's been a huge change of fortunes at the FCC. Outgoing Democratic chairman Tom Wheeler was recently replaced by Republican Ajit Pai, who is widely expected to be a more favorable chairman to business-friendly rulings like the repeal of net neutrality, and more friendly toward mergers and acquisitions. Sprint still hasn't given up on the idea of buying T-Mobile, with a recent Bloomberg article noting Masayoshi Son, SoftBank Group's CEO (and 70%-plus owner of Sprint), expressing hopes the new FCC will approve the deal. In that context, it's notable Son was one of the first executives to make the trek to Trump Tower to trumpet his commitment to creating U.S. jobs. However, even if Sprint does not acquire T-Mobile, the company has a proven formula for growing wireless subscribers, and will most likely continue to steal market share from Sprint, Verizon, and AT&T. It makes sense to pay close attention to T-Mobile in 2017. Daniel Miller (Dave & Buster's Entertainment): Dave & Buster's Entertainment owns and operates high-volume venues with a unique twist on dining and entertainment. The company's motto, "Eat. Play. Drink. Watch" has been a hit with millennials and families alike, and the company's stock has been on a tear as a result: up more than 200% over the past three years. Dave & Buster's is driving sales growth and profits by focusing on games. Image source: Dave & Buster's investor presentation. The high-margin gaming factor helps the company produce industry-leading store EBITDA (earnings before interest, taxes, depreciation, and amortization) margins. Many of its closest competitors hover around 20% margins, and often much lower, but Dave and Buster's checks in near 30%. The good news for investors is that there is plenty of room to run. Dave and Buster's had 211 stores operating at the end of 2016 and plans to open an additional 11 or 12 new stores this year. Also, its global potential remains largely untapped. The company signed its first international agreement in 2015 and its first store is expected to open in Dubai in 2018, with seven locations to follow in seven years' time. In addition to its rising stock, the company's financials have momentum as well. During the third quarter its comparable-store sales moved nearly 6% higher, compared to the prior year, which was even more impressive considering the comparable quarter had its own 8.8% growth. Its revenue jumped 18.6% higher, and adjusted EBITDA moved 41% higher. In an industry plagued with slowing traffic, Dave & Buster's is a star, and should continue to dominate in 2017. Matt DiLallo (Diamondback Energy): Amid all the carnage in the oil patch over the past two years, there has been a dramatic reset in the cost structure of shale drilling. Companies operating in the Permian Basin can now earn phenomenal drilling returns at current prices, enabling many to return to growth mode at much lower oil prices than they ever imagined. This monumental shift in the sector has Diamondback Energy poised for great things in 2017 and beyond. Thanks to its robust drilling returns and low costs, Diamondback Energy initially expected that it could deliver 30% organic production growth this year while living within cash flow at current commodity prices. However, the company recently ratcheted that growth rate up to 60% after spending $2.4 billion to expand its position in the Permian. That growth is coming just as the oil market appears to be finally turning a corner. However, as impressive as that growth rate is, Diamondback Energy is just scratching the surface of its potential. The company believes that it has the resource and acreage position to support 15 to 20 drilling rigs, well above the eight it plans to run this year. As such, the company believes it has the "runway for unprecedented growth for years to come" should oil prices continue improving. It is that combination of clear and compelling near-term growth and extraordinary upside potential that makes Diamondback Energy a top stock to buy in 2017. Todd Campbell (Core Labs): Core Laboratories may not be a household name, but you can bet it's on the speed dial of every top oil and gas producer in the United States. Core Labs is a major provider of oil and gas intelligence services and products, including tools that help evaluate the potential of oil and gas wells and improve their efficiency and performance. Demand for Core Labs products and services took a hit as oil and gas commodity prices tumbled, but the new administration in Washington hopes to reignite domestic production, and that could send this company's sales and profit higher. There's already evidence that a V-shaped recovery in oil and gas exploration and production is developing. Last week, there were 694 active rigs in the U.S., up significantly from a low of 404 last May. If growing production actively boosts Core Labs' top line, then management's cost-reduction and automation plans could mean that growth has an even bigger positive impact on profit than in the past. Despite sales slipping year over year to $143 million in the third quarter, operating margin of 15% allowed the company to report net income of $16.7 million in the period. Overall, if you think that the worst is behind the oil and gas industry, then Core Labs ought to be a top stock to buy in 2017.